The path to achieving sustainability for diverse populations could start with improving the standard of living and quality of life by changing the face of agriculture through enhanced farming. “The purpose is to improve the economic welfare of socially disadvantaged and limited resource farmers in the Black Belt area of Georgia,” said Dr. Mohammed Ibrahim, a Fort Valley State University agricultural economics professor, who is taking on that task. According to the U.S. Department of Agriculture (USDA), a socially disadvantaged and limited resource farmer is someone who experiences racial or ethnic prejudices because of their identity as a member of a group without regard to their individual qualities. Those groups include African-Americans, American Indians or Alaskan natives, Hispanics and Asians or Pacific Islanders. The USDA also refers to farm families with low financial resources as limited resource farmers. “The Black Belt Databook,” a research journal written by academic scholars, states that the historic Black Belt, a region of the southern U.S., consists of 623 counties that have higher than average concentrations of African-American population. These counties have at least the national average of 12 percent black residents. Furthermore, in Georgia and the southeastern U.S., counties with high poverty levels are termed as Black Belt counties. Ibrahim aims to identify and promote value-added agricultural and food systems in Georgia, including new types of cooperative ventures that have the potential to help socially disadvantaged and limited resource farmers increase farm income. Ibrahim’s research shows that the USDA’s Economic Research Service (ERS) classified about 7 percent of American family farm households as limited resource farms in 2012. In addition, most of the small farms in Georgia are concentrated in the south. Ibrahim said some African-American farmers are producing the same products during the season that only a small group consumes, creating a low profit margin. He wants to encourage more people to see agriculture as a business. 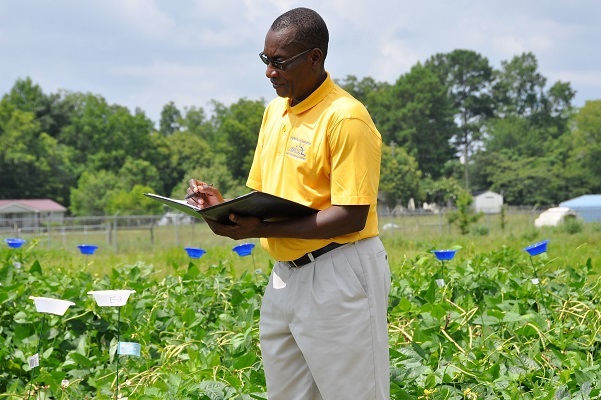 His goal is to offer a workshop on FVSU’s campus to teach farmers how to produce Asian and African vegetables such as amaranthus, bitter melon, bitter leaves and corchorus olitorius (ayoyo). To capitalize on value-added opportunities, Ibrahim suggests that farmers adopt one or more of the following three approaches based on their capability and resources. The first option is performing an activity traditionally done in another stage down the agricultural supply chain, which changes the form, space and time characteristics of the raw agricultural commodities. Another option is to vertically integrate several stages in the supply chain or horizontally coordinate with other farmers or bypass stages in the supply chain in order to create a connection between farmers and consumers. Lastly, he encourages farmers to perform an activity or adopt a production practice at the growing stage. This can change the identity or quality of the raw products to characteristics that consumers value higher in the market place. His objective is to establish a small farms applied economic research center on campus to study small farms issues and their impact on the survival of farms and ranches in the Black Belt region of Georgia. To help identify the value chains affecting farmers, Ibrahim is developing a questionnaire to determine the population of Georgia farmers currently producing value-enhanced commodities or other value-added products by commodity or product type. He will survey foreign-born consumers to gather information on potential demand for value-added vegetables. Ibrahim plans to share this information with farmers in the state’s Black Belt region, establish a plot on campus during the fall and involve undergraduate students in the process. Four of his undergraduate students are researching blueberries and other fruits, Asian vegetables and the quality of life in the Black Belt region of Georgia. “I can actually employ my students, which will give them hands-on training, experience and some income,” Ibrahim said. He noted some of them could also come up with innovative ideas for establishing their own future businesses. For more information about valued-added products, contact Ibrahim at (478) 825-6815 or ibrahimm@fvsu.edu.